I have a load of mp4 files which were rendered for about 50mbps, and I cannot play them at this bitrate via our system (a Humax T2 HD recorder with an ethernet port, feeding a Sony TV). The absolute max I can squeeze out of it is 15mbps, which is still ok for quality. They are 1920x1080 50/60fps. and (a) without changing the file names i.e. overwriting the original files, or (b) replacing the original files with "-15mbps" appended to the filename? I believe the above settings will produce perhaps the best quality, but I am more than willing to be educated there also File size or processing time are irrelevant. The videos are mostly moving over landscape (from an aircraft) or skiing. The ski ones need a lot of bandwidth, although I can't really tell a difference between 15 and say 30 mbps. Many thanks for any tips. BTW the target is a Synology DS216 network drive, mapped to a drive letter under win7-64. No, HB won't overwrite the originals, since the first byte written would cause the input not to exist. You can save your desired settings in a preset and use that for a batch, as well as set the autonaming convention in preferences. 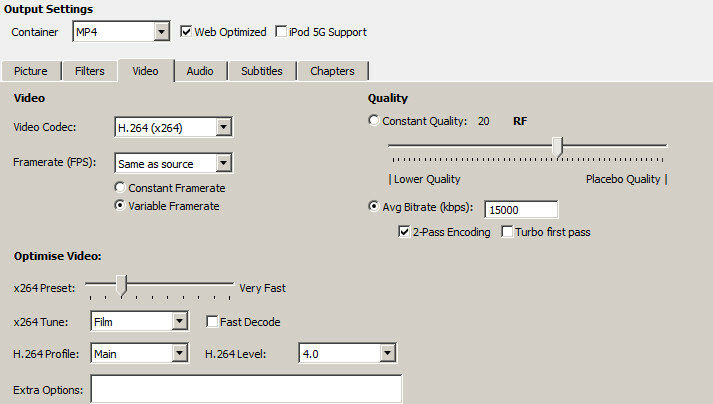 As always you'd likely be better off using quality based encoding, with vbv limits to enforce a bitrate cap to cope with your playback environment's limitations. Sure; one would need to create a temporary file, etc. Is there somewhere a tutorial for how to use HB in this way? Another approach might be a batch script (a .bat file) which invokes HB in a command line. Then one could do the renaming as required. The presets, audio/subtitle defaults, and automatic fine naming are all covered in the HB documentation. The quality of third party tutorials is very low and generally full of bad or outdated ideas. There exist several batch scripts in a variety of languages for doing things like this in the CLI forum, or it's a pretty trivial task to write your own.